I was recently reading a conversation online between some very committed Democrats and some very committed Republicans. Like many of the readers, I was floored when one of the Republican women called one of the Democrat women an “overemotional, angry, thick-skulled feminist”. Huh? This educated, enfranchised and employed woman was using feminist as an insult. How does this creature think she got where she is today, if not through the efforts of overemotional, angry, thick-skulled feminists1 like Abigail Adams, Emily Parkhurst, Susan B. Anthony and Eleanor Roosevelt? I got to feel smugly superior about my comparative enlightenment for exactly one day. 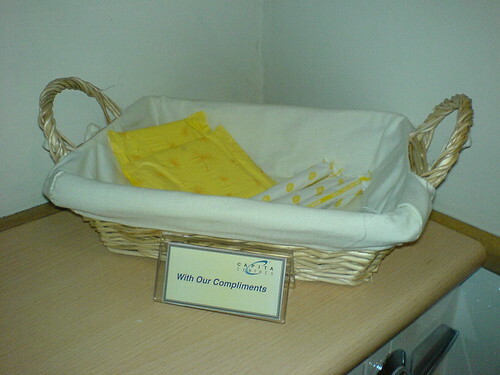 Then I found this basket in the ladies’ room of the Capita conference centre, and it made me squirm. It took me a while to realise why it got at me. It’s not the fact that sanitary products are set out for women to use – though the dynamic of being given them as opposed to buying them one’s self (even from a vending machine) is already a move from the intense privacy with which we deal with these matters. I hope Fiona is that bit more relaxed about these things when she grows up. Note that “feminist” in this context means one who believes that women should have equal rights to men. The use of “feminist” to mean “man hating freak” is a semantic hijacking.